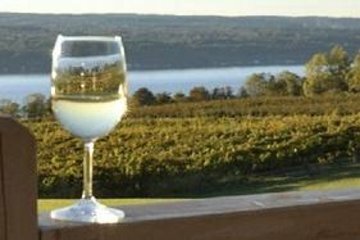 Explore la pintoresca región de los Finger Lakes de Nueva York durante una excursión de vino de medio día o día completo y cata con un guía experto. Recorra Seneca Lake Wine Trail, hogar de más de 30 bodegas, y experimente su historia, belleza y vinos de clase mundial. Su tour incluye cuatro o cinco visitas a bodegas, catas de vinos y transporte. Además, mejora para visitar una bodega extra con almuerzo incluido. Visitas a la bodega y degustaciones incluidas en el precio de su tour. Mejora para visitar una bodega extra con almuerzo incluido. Well there was only four of us, but we had a great time. We had our own mini van, that was unexpected but a very pleasant surprise. Kim was wonderful, very personable and easy to talk to. She took care of us, made sure we were checked in to the wineries and could spend enough time there. We had a great trip. The girls are hoping we can get together and do it again! This was an excellent tour. We took the half day and had four stops. Our tour guide, Phil, was knowledgeable without being too chatty. He went in the wineries and introduced us and made sure we knew what we were doing. I would recommend crush wine tours they were easy to communicate with when we had questions. I recommend the half day it started at 11:00 and ended about 3:00, that was enough for us.